Paul Devenny, music teacher and freelance violist. “I received the violin yesterday. I couldn’t be happier. It’s beautiful to look at and thrilling to play. Thank you for all your work”. “‘Addictive’ is the word that immediately comes to mind when describing my experience playing on my Martin McClean violin. In fact, I can say that Martin’s violin is one of those instruments that actually motivates you into practicing. 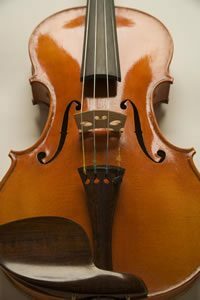 Along with a warm Italian sound, it offers a complex palette of subtle nuances, colors, and overtones, which are some of the characteristics commonly cited when playing on the great Cremonese instruments, including Strads. Indeed, even after two years of having the pleasure of playing on my McClean violin, I am still discovering new things that I didn’t know were possible on it! “I have been dealing with Martin McClean now for a number of years. The service he offers is both professional and accomodating. His workmanship is of exceptionally high quality and I would have no hesitation in recommending him to fellow musicians and students”.